Hey ya'll! It's Erin Eberhart Lynch from Eberhart's Explorers. 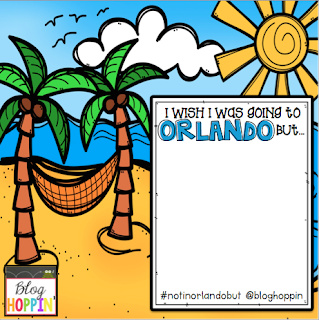 I'm so excited to be blogging at Blog Hoppin' today, but a little sad - too. 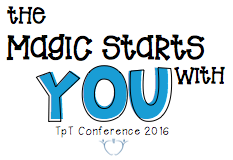 I feel like EVERYONE is gearing up for the TpT Conference in Orlando....but ME. The conference starts Wednesday and runs through Friday and is jam packed with fabulous presenters!! Some of our very own Blog Hoppers will be presenting. You can check out the list of presenters here. 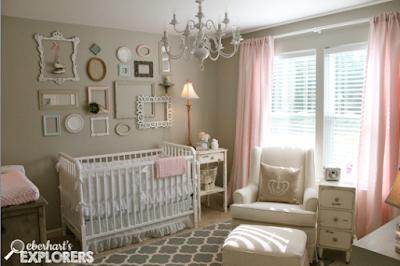 We've got a ton done in her room...but still have her closet to organize, gifts to put away, clothes to wash, things to exchange, etc. So, while I'm nesting and avoiding the summer heat - you all enjoy the conference for ME. For those of us not attending, link up with Blog Hoppin' on Instagram and tell us what you are doing instead. Just grab this image, use an app where you can add text to photos, and post on Instagram with the hashtag #notinorlandobut. Remember, to link up with @bloghoppin and check out all the posts from the people attending. To stalk them and see what they're up to in Orlando, use the hashtag #tptorlando16! ha Can't wait to hear why you can't go. Maybe next year? ?